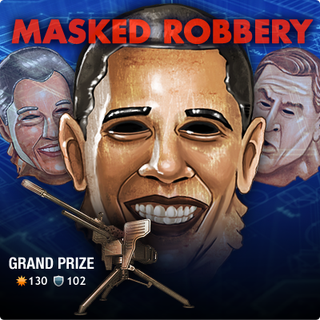 Fresh off cameos in NBA Jam and NBA 2K11, President Obama and his two predecessors are appearing in Mafia Wars. As novelty masks, anyway. A bank heist weekend offers the chance to get them, and a badass machine gun. If you play the game, you know how this Zynga stuff runs - bug everyone in your network either by sending these masks to friends or asking them to send one to you. Collecting three, five or ten of one mask will unlock special items. Getting all 30 delivers some virtual piece of firepower called The Executive Decision, which has some pretty badass attributes (namely, 130 ATT, 102 DEF). The masks are the "Bubba Mask," the "Dubya Mask" and the "Rock Mask." More details at the link.